Rasa means To Taste or Feel in Malay. The book is an invitation to experience Singapore through its cuisine. Snippets of information about the island nation will take you on a tour of the culture of the peoples of this Garden City. Every recipe for a meat/fish dish can be converted into a vegetarian one. This allows your vegetarian member of family or guest to have a similar sauce as the carnivore except for the swap in the main ingredient. This takes the hassle out of providing a special dish for the vegetarian and the vegetarian will have an increased opportunity to sample different exotic dishes. There is no cook-book on the market that does this conversion. This book has been favourably reviewed by the Coeliac Society of UK because it contains mainly gluten-free recipes. As this book was written for the Western market, it uses ingredients that are readily available in the West. 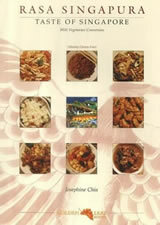 Sections on Tips And Information and Serving A Singaporean Meal make the recipes easy to produce. Preparation and Cooking Times are also included to give you an idea of how long it will take for you to cook the dishes.